Our kids are besties (and almost literally next door neighbors) so they tend to hang out a lot. So much so that I think my children would prefer to be at Molly and Darby’s house rather than ours most days. Their little, Molly, is just a smidgen older than my Noah and they’re the best of buds. They share an obsession with Minecraft and can spend hours at a time building worlds. And their oldest, Darby is the coolest thing since sliced bread according to my little Lia. They play house and family where Lia gets to be the baby all the time. A perfect world for her I assure you. Fall in Northern Virginia is one of my favorite times of year. We get maybe a month of glorious temperate weather coupled with the beautiful red and yellow hues of the changing trees before things change for winter and we’re sure to make the most of that time! We were planning a weekend out anyways when the girls’ mom asked if we wanted to join them. Of course – what a great way for the kids to play – out in the great out doors! 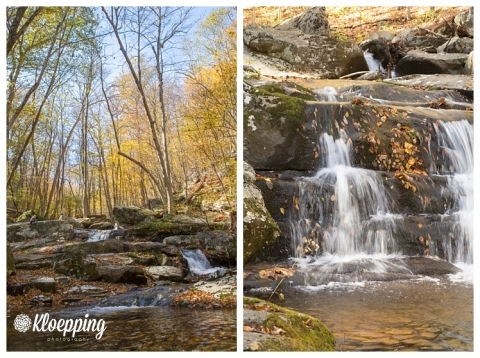 We headed to a favorite hike of ours – Rose River in Shenandoah National Park. Though fall season is one of the busiest for family photographers, I try to leave at least 2 weekends a month open for family stuff. It definitely limits what clients I can take and forces me to be creative with scheduling to accommodate a many as I can. But, the kiddos are only this size once and I want them, more than anything, to have memories of a mom that was present and fun! Hike like this – even if I’m getting yelled at by my little (like in the pics above) – bring back great memories. Watching the kids jump and explore the world around them without the distractions of phones and video games reminds me of my childhood spent outdoors. We’d venture out just after the sun came up and then stay out until the fireflies appeared (mom and dad yelled for us to come back in). We’d oblige and drag our tired, dirty, sweaty selves back in for dinner and bath time. We’d crash hard and wake up to start all over again the next day. These kids played hard. If there was a rock, it was climbed upon. If there was a log, it was used as a balance beam. If there was a stream (and there was the entire hike) it was jumped in and out of . Almost every kid ended up somewhat wet (some wetter than others – Lia went in up to her waist thanks to a deceiving pile of leaves). At the end of the day we arrived back to the car dirty, sweaty, and hungry but satisfied. The kids were tired but the smiles on their faces told me they had a great time. We even swapped kids for the ride home and Noah rode with them while we took Darby with us. I hear that they talked Math and Minecraft the entire way home (while my car full made bows and accessories). A quick bite to eat and a bath and the kids hit the hay hard. I think Lia was asleep before her head even hit the pillow. A good day in my book!